It’s time to stop wasting valuable time and money on unused product. 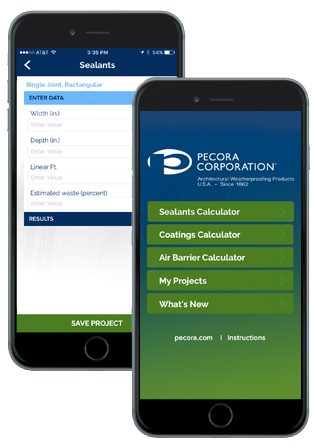 Estimate exactly how much product you’ll need for your next building project with the Pecora Sealant & Coatings Calculator. Through our mobile app you can take your calculations and information on the go. Simply input the data required for your sealant, air barrier, or deck coating project and hit the update button to get your estimate. You can even save your estimates in the My Projects section to review them later. Your personal project data is always with you. Once you’re finished, send out data directly from the app via email or text message. The Pecora Calculator also app is available for free on the Apple App Store and on Google Play. Download the App today!